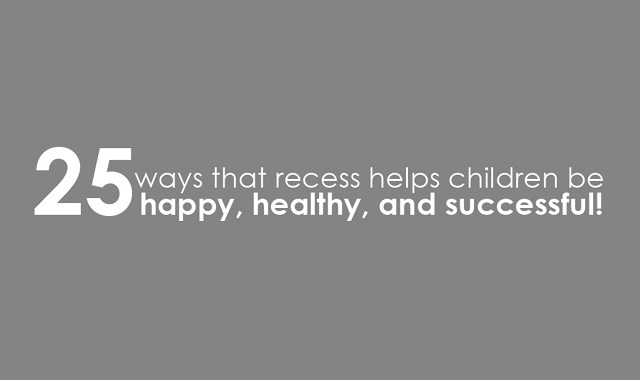 25 Ways that Recess Helps Children be Happy, Healthy, and Successful #infographic ~ Visualistan '+g+"
For kids, recess is crucial to their development into happy, healthy and successful adults. As Fred Rogers famously said: “Play is often talked about as if it were a relief from serious learning. But for children play is serious learning. Play is really the work of childhood.” This graphic explores 25 statistics, quotes and anecdotes relating to the power of free play and the role recess plays in creating fully-formed children. Studies show that kids who have more opportunities for free play during the school day tend to become more well-adjusted as they grow older. Educators may find this graphic interesting and useful, and may be able to apply some of the data here into their lesson plans. They may also recommend these options for free-play to their school administrators. Any advocate for increased free-play, with the goal of building children’s character beyond the classroom, will certainly appreciate this infographic from AAAStateofPlay.com!